I started writing this blog in October 2013. Since 6 June I have been dealing with the awful news that my mother has terminal lung cancer. I can remember the day I called up to Antrim Hospital when she asked me to pull the curtain around the bed and told me "they have found a tumour". My mum doesn't smoke, rarely drinks alcohol (a couple of glasses at Christmas is about the limit) and kept herself fit and healthy. She was 74 in August. Her cancer journey wasn't more than a cul-de-sac with the physician referring to an oncologist who told us that there was nothing that could be done. No treatment. No cure. No surgery. Nothing. In many ways, his calm, caring clinical explanation was much easier to deal with despite the fact that I wanted to curl up into a ball and sob. After much pressing he revealed to my mother that her life expectancy was going to be limited to a few months. In January (prior to her cancer diagnosis), my mum had her second hip replacement, and I remember worrying if she would be ok with the surgery, but the doctors were happy and even remarked that she was one of the few "healthy" patients they had. 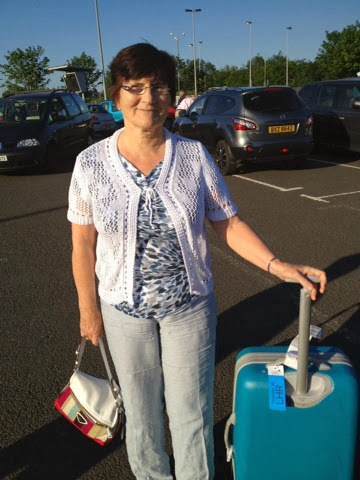 In April, we booked our flights to Dubai for December to attend my brother's wedding, my mum had already her outfit sorted and was so looking to taking Jade and I to the Gold Hotel for cocktails. As I approach November, in the sure and certain reality that her illness is advancing rapidly, she's weak and wants to exit this world and the pain her body is trapped in, I reflect on the depth of her love for me and my brother. My mum passed away on 15 November. The church was completely packed for her funeral and the service was by Rev McCorriston was one of caring, christiain compassion. It was perfect in every way. It was a very tough day but I'm so glad we did everything she wanted. My mum loved breaking the mould. She had a willow coffin. Everyone commented on it. She'd have loved that. Update: it's now almost a year since my was diagnosed with Cancer and just 6 months since she passed away. Some days are still tough.